While not new, project-based learning has become a popular method to try and move beyond surface-level learning. Many teachers are trying to figure out the right ingredients for strong projects that interest and engage students, while helping them meet required learning targets. But implementing project-based learning well isn’t easy, especially when many teachers are more accustomed to direct instruction, when they can be sure they’ve at least touched on all the topics in the curriculum. On top of the push toward projects, some educators are also embracing maker-education, a distinct but often overlapping idea. “There’s a lot of research out there about integrating making into project-based learning to ramp up what students are learning in the core content areas that they’re going to be tested in,” said Michael Stone, an Albert Einstein Distinguished Educator Fellow, who taught high school in Tennessee. When Stone taught calculus, he was a fairly traditional teacher, but just before taking the Einstein Fellowship, he became director of the Fab Lab and project-based learning coordinator at the STEM School Chattanooga, a high school recognized for giving kids from all over the city access to powerful learning opportunities. Before the STEM school, Stone was skeptical of project-based learning. He said it had always been pitched to him as a process where the teacher got out of the way and the students learned on their own, something his experience with kids and calculus made him doubt. At the STEM school, he quickly learned that project-based learning actually requires a lot from teachers, and when done well can produce amazing results. Now he helps teachers in Chattanooga experience project-based learning professional development to help them build their skills. While this may seem obvious, it’s especially relevant around maker-education. While many educators are excited about the potential for making to spark deeper engagement with learning in the classroom, often school makerspaces are separate from classroom activities. 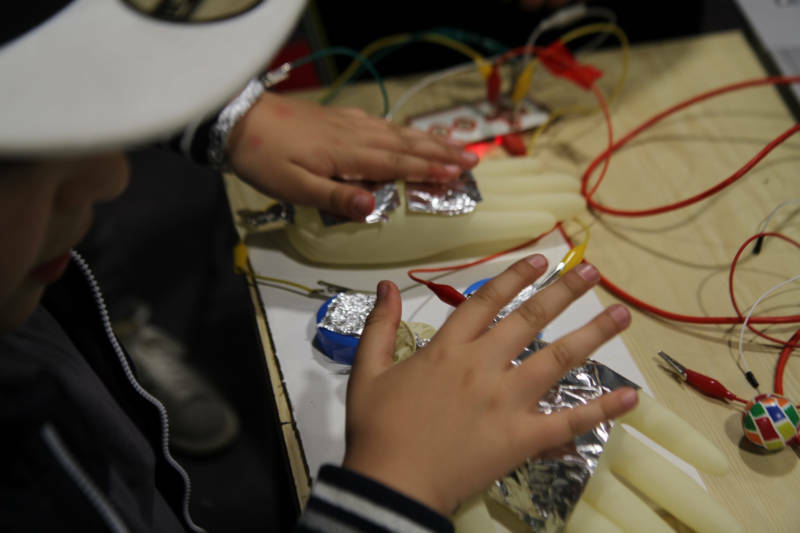 Some would argue that distance is good, allowing making to remain a self-directed tinkering exercise, but others argue that without clear connections to the curriculum, making in schools may be seen as tangential. A hands-on making component to a classroom project could be a great enhancement, but Stone said it must be part of a clear plan driving toward learning outcomes. To engineer this type of learning experience, backwards planning is key. One reason experienced project-based learning teachers like the approach is that it encourages students to discover new concepts and to make meaning out of them on their own, with support from the teacher. And there’s a lot of research showing when students learn this way, they remember more and better than when someone merely tells them the information. So the strength of a project depends heavily on the initial driving question developed by the teacher. “That’s by far the most challenging part,” Stone said. “We want the question to perfectly balance open-ended components, but with enough constraints that it’s pushing them towards learning targets.” Stone knows the project is well designed if two weeks into it the students are asking for the content he wanted to teach them. Through their exploration they came to a point where they need those pieces of content to answer their questions. Stone also said it’s crucial to design the project rubric around that driving question. “We want to make sure that we’re assessing what it is we really want,” Stone said, so the teacher should constantly be referring back to the driving question as the main filter. The rubric should be clear about the expectations and how students can demonstrate they completed them and in an advanced way. This is a big tenet at the STEM School Chattanooga and a core part of what the school’s founder, Tony Donen, says makes it a STEM school in the first place. Students are always being assessed on process skills like collaboration, critical thinking, communication and innovation alongside the specific content goals. Stone says the rubric itself should have the process-oriented goals alongside the content goals so students understand they are of equal importance. Those two things side by side are the “why” behind the project, which means the actual final product is irrelevant and could be different for each group. If students are interested in the driving question, discovering the content as they need it, and demonstrating growth in process skills, what they ultimately make is far less important, Stone said. Making it clear that process is as important as “getting it” is also important for the kids in any class who tend to understand quickly, but don’t always do a good job of documenting why they know. Stone said he’s given groups that made incredible final products low scores for not demonstrating process skills along the way. “Everyone is capable of solving the problem,” Stone said. Teachers have to start with that perspective and then think about how they can help make up ground for the kids who started behind. With experience, teachers can begin to anticipate the moments when students might stumble. As Stone grew in his practice as a project-based learning teacher, he began to see how crucial this step is for successful execution of a project. In addition to thinking through the driving question and the learning standards students would need to answer that question, the teacher also thinks ahead about the likely gaps in skills students are going to have both in content and process. For example, if the project is going to require factoring binomials, the teacher might anticipate that some kids won’t know how to follow a two-step equation. And collaboration is one of the most difficult process skills, especially for less mature learners, so the teacher might also anticipate that parts of collaboration won’t be intuitive to student groups. “We make sure that while we’re identifying those things, in the planning phase, we’re identifying exactly what activity we’re going to use when that happens,” Stone said. For collaboration, a teacher might use open-ended questioning to help coach students through their stumbles. For content issues, Stone thinks about scaffolds, or wedges as he calls them, in a few different ways. Whole class activities: This is brand-new content for everyone. Station activities: This is content everyone needs to acquire, but not at the exact same time. “It allows the teacher to identify which piece of content is going to be the most difficult, and that’s where she can spend the most time coaching up,” Stone said. The other stations might be novel and require time, but may not be as cognitively challenging. Workshops: This is an option for small groups of students who either feel they could need a review or the teacher sees they need a little more help. Focus groups: Mandated time with the teacher because there are some prerequisite skills that a student needs, without which the project won’t be accessible. As teachers plan their projects -- weeks before students even see it -- they are thinking about these categories of scaffolds and where in the project they foresee needing to use them. “When teachers can think in that way ahead of time and plan for those necessary scaffolds within those confines, we find it really helpful,” Stone said. This becomes easier to do after a few projects and as students get older, but works especially well around skills like collaboration. At the STEM School Chattanooga, students make contracts with one another about how each member of a group is expected to participate, and students set the consequences for failure to do so. In the first project they might make very light consequences, but then one kid gets stuck doing all the work and decides to put more teeth into the consequences next time. “We let them give each other detention; they could reduce their final grades,” Stone said. He found it liberating as a teacher because when a student didn’t meet the terms of the contract and received a consequence, she couldn’t complain because she had helped to design it and agreed to it at the beginning. Often, Stone said, the student-designed consequences were far more brilliant than anything he would have ever come up with. When Stone coaches educators in project-based learning, he stresses that the point of the methodology is to put students in a position where they are solving authentic problems, not to check a box. Putting students in these kinds of situations creates opportunities for accidental learning, as does making, which is partly why making-enhanced project-based learning can be so powerful. The key thing for educators to remember is that both of these pedagogical strategies, which can go hand in hand, should be in the service of providing deep learning opportunities.